obscene chewing: the thunderdome of rhetoric. To this fact-averse rank-and-file's credit, it should be acknowledged that—as far as many political issues go—we are at the mercy of the media. We have no way of verifying much of the information we receive, and much of the information we receive comes from privately-held news organizations that cannot be entirely divorced from their commercial interests. I don't know about you, but this tends to make me feel a little powerless. It's the same way I felt when I finally moved out on my own for the first time and discovered that there were opinions and even interpretations of reality different from the ones that my (extremely conservative) father held. Then, all of a sudden, Plato's allegory of the cave had real meaning for me. It's like I'd been looking out a tiny window all my life at a mostly unchanging and unpopulated landscape—and I thought this was all there was to the world. But of course there's so much more. And there's always that nagging doubt that there is still always so much more than I think there is or could even possibly imagine. I'm getting grandiose here. 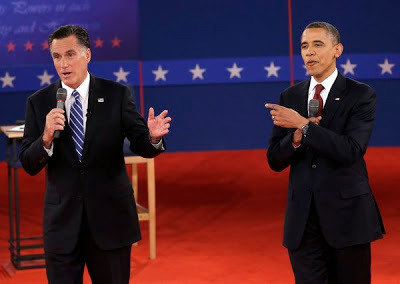 I'll put away the fog machine and send the choir to bed, and ask you a more pointed question: Don't you feel that the two directions that Romney and Obama proscribe for America are just what is visible from the tiny window? When it comes down to it, they're both stiffs in navy blue suits with flag lapel pins—often pandering shamelessly to a moronic constituency that isn't capable of thinking through complex issues or understanding thorny causal relationships? 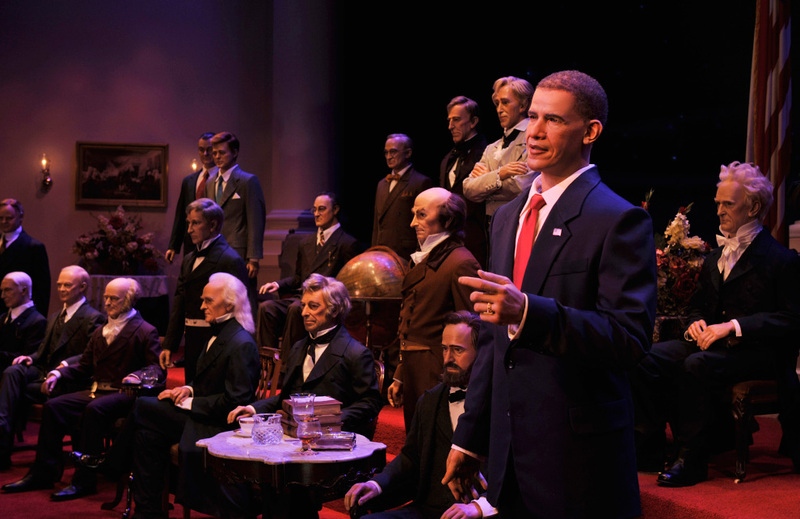 Don't they seem animatronic? They've been rehearsed, polled, programmed, groomed, and (yes) manufactured by powerful financial and political interests. It doesn't exactly make me want to jump up and down with enthusiasm. I hate to be the pessimist—no matter how accustomed to the role I am—but I feel that Obama was the nail in the coffin of passionate politics. His hope and change, in many ways, turned out to be anything but. Now we have to settle for the 'Lesser of Two Evils' school of politics. That seems to be the most we're entitled to anymore. Anyway. The debate. I didn't watch the previous one—although of course I heard how poorly Obama performed. I wasn't really surprised. Obama is not a good public speaker in general—and he's even worse without a teleprompter to nudge him along. His delivery is often what I would characterize as strident, aloof, haughty. Last night's performance didn't change this opinion very much. It was basically Smug vs. Strident. Neither Romney nor Obama exudes anything like the warmth and personality of, say, a Reagan or a Clinton. I know this is a shallow view of politics—but it would be nice to root for someone who is vaguely human. I know, I know... Both Reagan and Clinton were 'human' even when they were doing and saying dumb things. But there are how many people in America now? Over 300 million? Shouldn't I be able to have my cake and eat it too? It seems ludicrous that—with all these people—these are the two choices I have... Maybe that's the point. Maybe these two are just bland enough to be president in the 21st century. The bright side is that I'll take blandness over Michele Bachmann any day. I know I should vote, but my heart isn't in it. Apathy is the new social consciousness.